Invite students to learn about the four types of sentences by playing a kinesthetic game (four corners) and creating a digital selfie comic strip! 1. I can identify the four types of sentences: declarative, imperative, interrogative and exclamatory. 2. 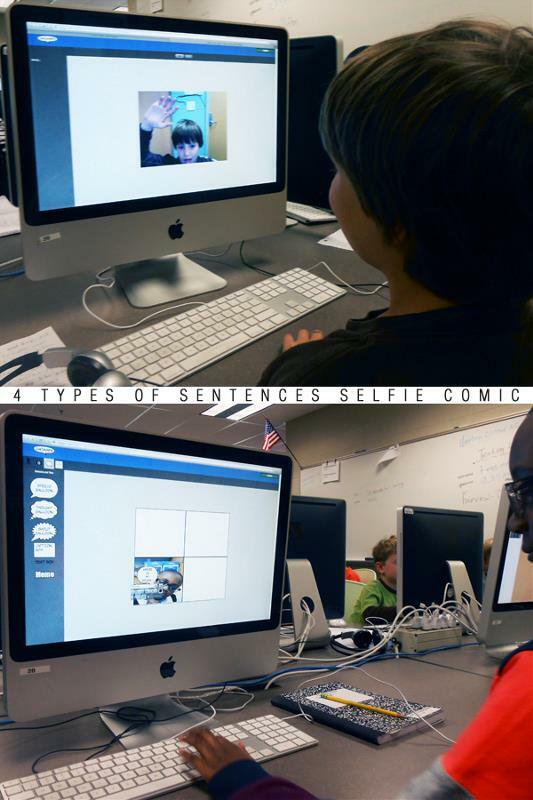 I can create a digital selfie comic strip with the four types of sentences. 3. I can add punctuation to sentences and determine the sentence type using a color-coded system. 1. Hang the sentence banners in each corner of the classroom. 2. Students choose a corner in which to stand. 3. Teacher reads a sentence. 4. 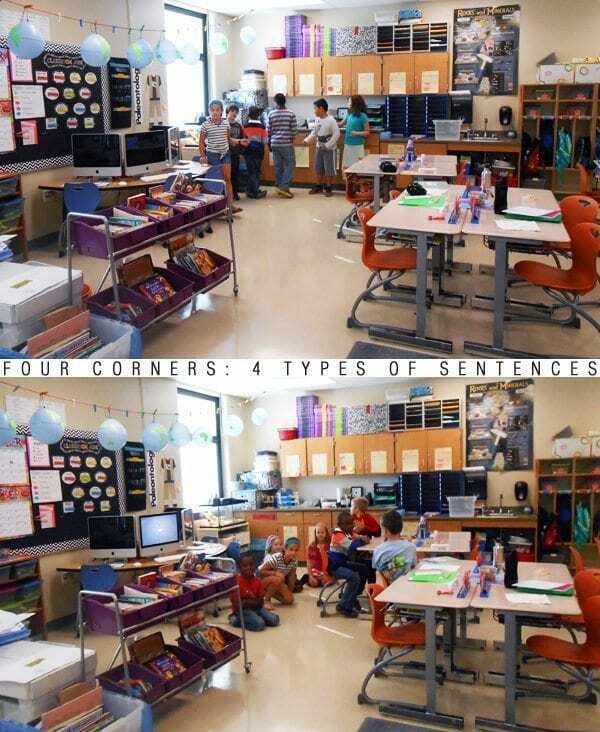 If students think it is the sentence type designated by their corner, they sit down. 5. If students are wrong (they stand up in the wrong corner/don’t stand up in the correct corner), they are out of the game! 6. Students who are correct get a punctuation badge (sticker). 7. Teacher reads 10 sentences (included in the PDF). The student with the most stickers is the Sentence Champ! Punctuation badges shown above: round color-coded label stickers with punctuation marks ( . ? ! ) drawn on them. Using the Web 2.0 tool Chogger, students create a Selfie Comic Strip using the four types of sentences. 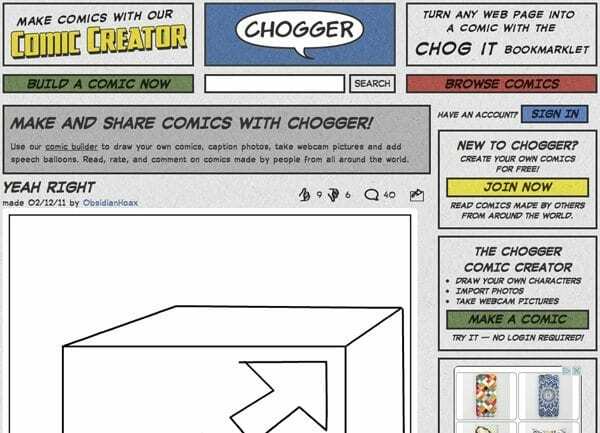 Have students choose the four-box template on Chogger. 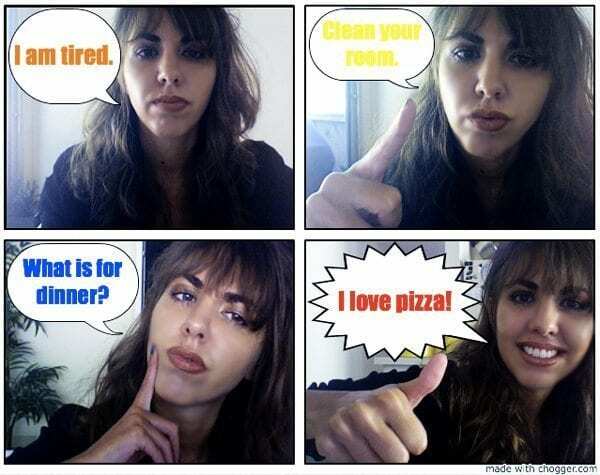 Next, they take selfies of themselves making different facial expressions to match each sentence type. After students have their head shots placed in the boxes, have them add speech bubbles and type a sentence in each one. Not only is this project fun, but teachers can assess the students’ writing and understanding of the four sentence types. Once students finish their comics, take screenshots of their work. Then you do not have to worry about creating a login or password on Chogger. Have the students place their screenshot in a word document and create a title: Four Types of Sentences Comic. Then, print it out for the students to share! Pass out the Exit Slip featured below and have students use a color-coded system to write their punctuation and sentence-type names. For reinforcement, have students use their new knowledge and skills of sentence types by using four different highlighters and finding the sentence types in one of their writing compositions. 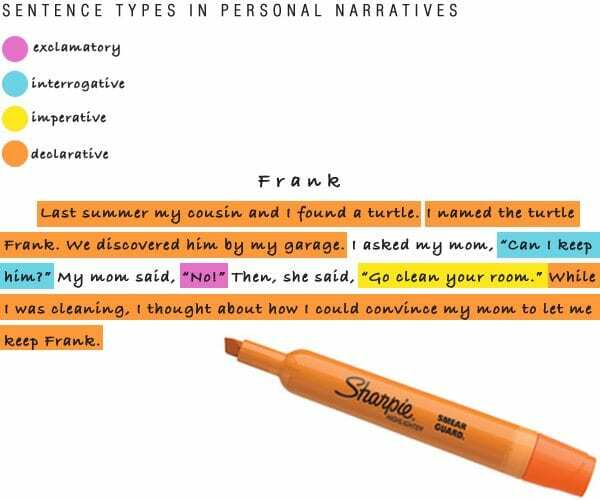 Tell the children to choose one of their narratives in their writing notebook. They must choose a highlighter color to represent each type of sentence. Then, they highlight sentences in their composition, color-coding them by type. Once they are finished, have them check with you to see if they were able to identify the different types in their own writing. 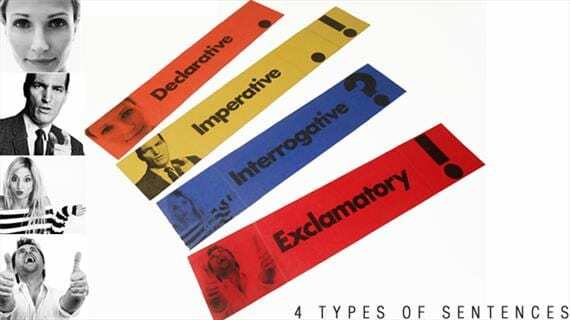 As a whole group, go over the sentence type vocabulary: declarative, imperative, interrogative and exclamatory. Ask students to give you the definition for each one. Then, have the students share their comic strips with their peers to help further their understanding of different sentence types. Click here for an editable rubric.